The music playing in Charlotte’s living room is a bit on the loud side, but most people would think nothing of that, but she turns it off as soon I arrive. “I still enjoy music, but my hearing is not up to having background music on when I am trying to talk to someone – I just can’t make out the words and follow the conversation,” she says. Two years ago, Charlotte woke up on an ordinary day and got her two children up and walked them to primary school. It was a warm morning in early September and she had planned to go home and start decorating the lounge. “I had left my previous job in a local supermarket – it was part time and had fitted in well when the children were small, but I had recently been accepted to re-train in social work and I was so excited.” As Charlotte had a couple of weeks before her course began, she was using the time to do some home improvements. Charlotte put her favourite CD on and started painting the ceiling, enjoying the music and thinking about what they were going to have for tea. “The next minute, I was lying on the floor – fortunately the paint was still attached to the ladder but I had dropped the brush and I had spots of paint all over. I thought maybe I had overdone things and fainted and, I assumed, wrenched the socket out of the wall and stopped the CD player because the music sounded funny,” she remembers. As she tried to sit up Charlotte realised that something was more seriously wrong; the music was still playing but her hearing had completely gone in her right ear and was weak in her left. “I also felt very dizzy, so I thought maybe I had some awful ear infection. I crawled to my bag in the hall and found my mobile and called my husband at work. He was home within half an hour and he took me straight to the local accident and emergency,” she recalls. By some miracle, accident and emergency at the large university teaching hospital nearby was fairly quiet. After ruling out that Charlotte wasn’t showing any signs of infection, the doctor who examined her agreed that the problem must be within her middle ear, as both her hearing and balance was affected. “I was amazed that I was seen by an ear, nose and throat specialist that afternoon. It was the day of his clinic and I had to wait two hours in the queue but they fitted me in as an urgent case,” explains Charlotte. The news was not good. Tests showed that Charlotte had significant nerve damage in both her ears – and the ENT specialist told her she had a rare ear disease – autoimmune ear disease. “He told me that, for some unknown reason, my body had started to attack the nerves and tissues in my inner ear, causing severe damage. It wasn’t happening anywhere else in my body and I have never had problems with my ears, so I can’t think why it suddenly came on,” says Charlotte. The doctor also explained that if Charlotte didn’t start treatment with steroids and other medicines to damp down the immune response in both her ears, she would lose her hearing permanently. “I started on steroid injections inside both ears that day and I had them regularly for three months, and I took tablets too. It was very frightening and, of course, I had to postpone starting my course, which was very disappointing. After three months, Charlotte’s hearing in her left ear had improved markedly and the right ear was getting better more slowly. “At least I could hear well enough to get a hearing aid – a small digital one that we had to pay for – and I started by course after Christmas. Since then, I have had ups and downs but I am now managing with less frequent injections and no oral medication at all. 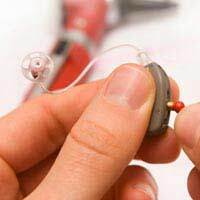 The most worrying thing is that my hearing could deteriorate again at any time; when I wake up in the middle of the night and it’s quiet I often startle myself and need to make noise to make sure I can still here - which drives my husband mad,” she laughs.